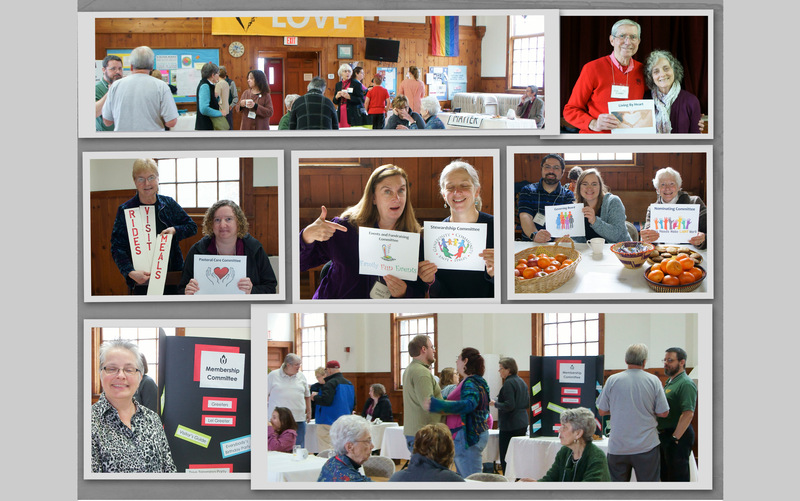 Whether you’re searching for meaning, mending a broken heart, or simply needing some friends who share your values, Unitarian Universalism is here for you: connecting, caring, healing.Unitarian Universalism connects you with real people: people who will be real with you. Learning and laughing across generations and cultures, we build relationships of care and support. Every group, committee, and team in our congregation has its own special ways of connecting and caring. Whatever your age and stage, you can meet people, engage in groups and programs, and volunteer in ways that build community and nurture others. After each Sunday service everyone is invited for a cup of coffee and some light refreshments in Parish Hall.Our Coffee Hour teams make sure this tradition, enjoyed by so many, continues. It is a wonderful chance for newcomers to meet members and learn more about the life of First Parish. If you want to be part of a Coffee Hour team, please contact Renee Peace. Sign Up for Coffee Hour Here! All are invited to enjoy a friendly, casual gathering on the next to the last Friday of each Month at 6pm in the Parish Hall. Bring a homemade or store-bought dish to share and we’ll break bread together. Don’t have time to cook or shop? Come anyway, we really just want to get to know you better, spend time in fellowship and enjoy your company! Can’t make it at 6:00 p.m.?Come later for dessert! It’s a great time of food and fellowship! Every Wednesday Dinner is served at Trinity Church on Main Street in Northboro to anyone. Donations accepted, but not required. This is an amazing community service project that FPC Northborough has been proud to be a part of for over 20 years. First Parish Northboro prepares and serves the meal approximately every 9 weeks. We have discussed keeping the effort simple by identifying one meal that will be served each time it is our turn. For example, if we chose lasagna the Meal Prep Lead would recruit people to make enough lasagna to feed the projected amount of guests (60 -70 people). A salad and bread might be added, as well. Please help us continue the tradition by volunteering to be on the team. Adding your name to the list of volunteers does not mean that you are committing to every time we serve. You are invited to participate as you are able. It will be helpful if I could hear from everyone who is willing to participate. Even if you have been participating for years please contact us anyway so that we know who you are.Call or email Alicia Coderre or Adi Pandit if you would like to volunteer for this effort. Please include how you are willing to participate. Thank you! Meets Mondays at 2:00 PM at the home of a member of the group; location changes. An informal gathering of knitters and other needle work enthusiasts. Announcements for the weekly email and Sunday bulletin are due by 10 am Thursday. Please forward by email: office@firstparishnorthboro.org. In the event of severe road conditions the Sunday worship service or other planned events may be cancelled. Please check your email, visit the website, or call the Parish office 508 393-6422. This important information will be available Sunday morning by 8:30 am. For other events cancellations will be determined and made available 2 hours prior to the time of the event.